Looking for a way to make your advertisements pop? 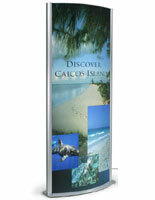 Our illuminated poster stands literally light up your signage! 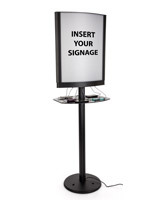 This selection of display frames for backlit advertising is a bold way to get your message across to passersby. 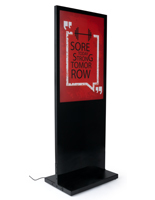 We offer illuminated poster stands in a variety of styles and designs to complement any setting and enhance your brand message. 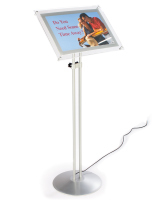 These backlit signage holders are perfect for all kinds of locations, especially those that generate lots of foot traffic. With their size and unique construction, illuminated poster stands hardly go unnoticed. Browse through our selection of light boxes today to find one best suited for your needs! What sorts of designs do these light boxes come in? 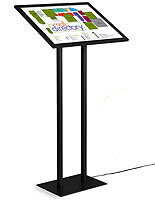 Illuminated poster stands come in various sizes to accommodate a multitude of media sizes. 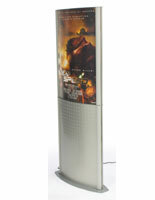 The totem-style display holds two posters back-to-back. 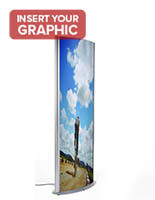 Each poster lightbox stand contains light bulbs inside so that your movie advertising or graphic is backlit and can even be seen in the dark. 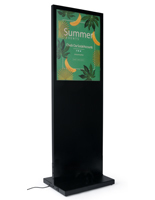 Some towers have a sleek black panel bottom or an aluminum base with an imprinted square design that adds texture to the display. 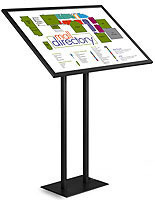 Directory stands with large flat, slightly angled surfaces are designed for use in malls or other commercial locations to show all the shops and stores to passing customers. Freestanding directory and lobby-style pedestals come in a few different media sizes and are a bold statement in any setting. Backlit A-frame signs are a great solution to “sidewalk” style signage. 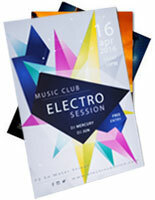 Place these outside a bar or nightclub to get patrons’ attention. These smaller models are also well-suited for placement in lobbies or near entryways with lots of foot traffic. These will educate entering guests about available services and products without getting in the way. 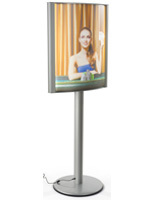 Backlit signage holders are captivating advertising fixtures that instantly grab attention. 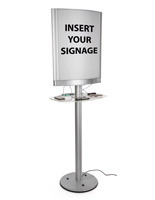 Stand out from traditional and uninteresting signage with any one of these lightboxes. 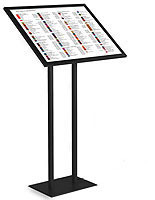 What type of lighting do these backlit signage holders utilize? 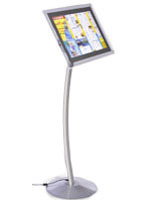 The double-sided, totem frame stands use either fluorescent or LED lighting. The construction of this poster light box makes changing the bulbs a quick and easy task, while LED units rarely need to be changed. 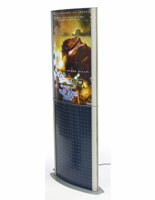 The flat one-sided backlit directory boards are LED illuminated. 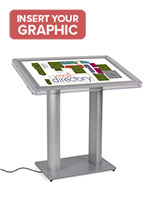 This lightbox display stand will ensure even lighting throughout your frame. When comparing fluorescent light to LED, the latter is more energy efficient and lasts longer but has a higher upfront cost. Regardless of the style lighting you choose, the result will be sure to enhance your advertisement! 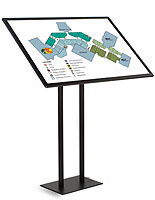 At Displays2go, we have a variety of signage holders and stands to complement any setting. Illuminated units aren’t for you? 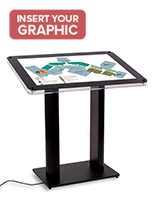 Try poster stands with wheels if you need to take your display on the go! Shop online to take advantage of quick shipping and the lowest prices.